Dr Luke Boulter’s lab is looking at genetic screening and the functional drivers of cholangiocarcinoma. They have generated organoids from the human bile ducts and cholangiocarcinoma of a patient so, importantly, they can carry out their screen in human cells, not just mouse cells as previously, and are hoping this will give them some really important insights into how cholangiocarcinoma begins. 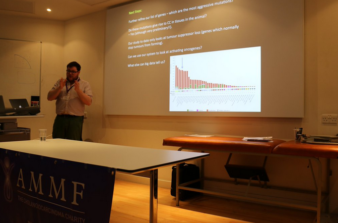 Dr Boulter at AMMF’s conference, May 2016, talking about cholangiocarcinoma mutations and explaining which gene is his favourite!